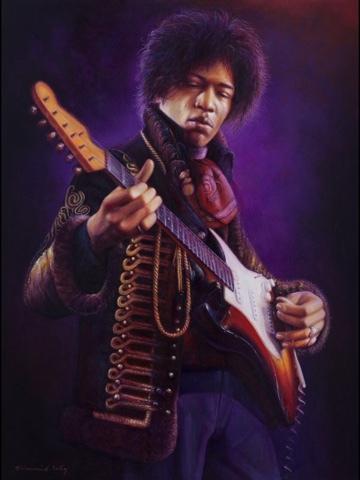 Oil painting of Jimi Hendrix - simple steps. and white over soft salmon base ( primed canvas). Step 2. A little further along- almost ready for color. Step 5: highlights and final glazes, done! 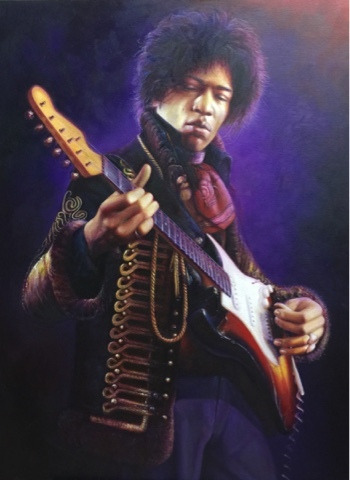 This piece is 1 of 12 from my Icons of Rock Series - Guitarists. Road to Calvary- oil on canvas - 22" x 28"
I completed this piece early last year. To say that this was one of my most challenging pieces is an understatement. I carried out extensive research on the techniques and paintings of the masters from the Baroque time period. Caravaggio's paintings have always fascinated me, even from a young age. 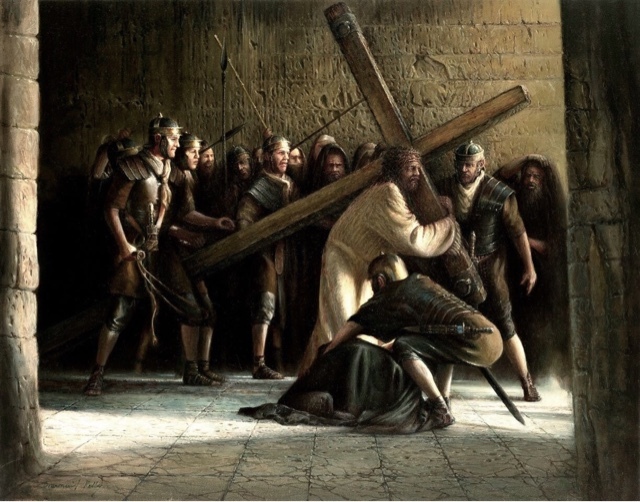 When I viewed the movie " The Passion " several years ago it reignited my interest in the this time period and (although brutal) the way of life depicted. What surprised me most while painting this piece was how it effected me mentally during the painting process. I had to step away from my easel several times. I had to place myself there, in that time period over 2,000 years ago for the piece to work. I had a hard time dealing with painting the type of cruelty being inflicted. To be honest I had to tone down the piece from my original concept which was based on accurate accounts of scourging which was a popular public form of humiliation and torture. We see paintings with similar subject matter in Galleries and museums and sometimes I don't think we think enough about what's actually happening in these pieces. The knowledge I have gained from this piece has been invaluable. It has also taught me a few things about myself as a person". 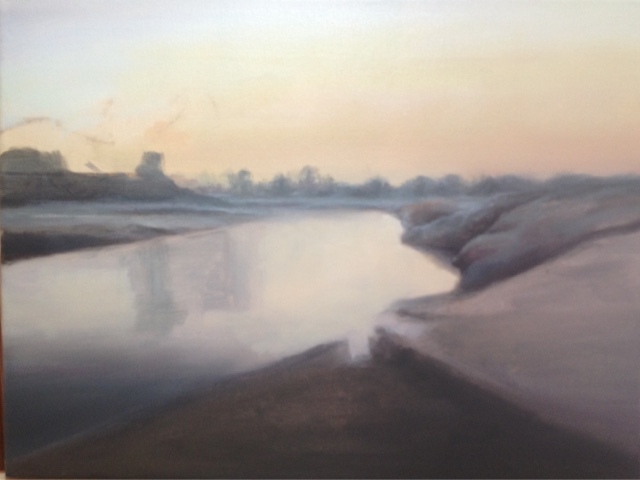 A simple approach to painting landscapes in Oils. Detailed oil paintings can be made so much simpler and enjoyable if you just work in layers. 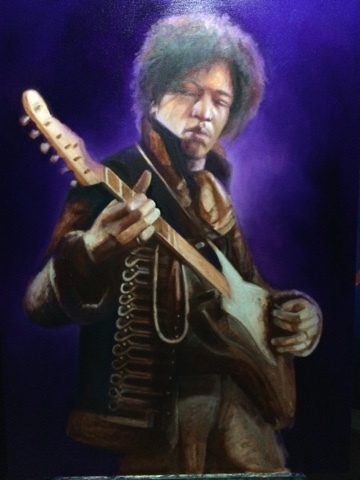 It's an old school classical approach to painting and can result in a professional looking painting in a surprisingly short length of time. The key word for me as always been patience. Priming the canvas with the correct color before you begin your painting is key. I mix flesh tint, combined with Naples yellow and titanium white to achieve a soft salmon color. Mixing medium: Liquin (encourages fast drying). Apply evenly over the entire canvas and let it dry overnight. 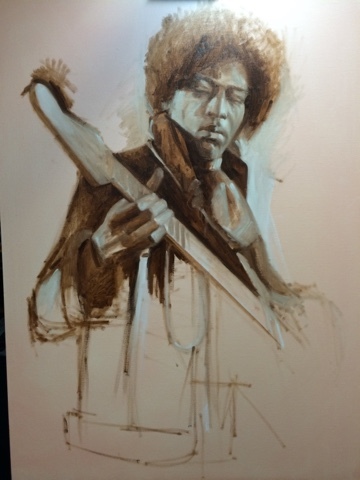 Once the primed color is dry you can start to block in your composition. I use only burnt umber and titanium to block in. I mix liquin through your paint to speed up drying itme. I look for important information within the composition, such as shapes lights and darks. Contrast is important. While I am letting this layer dry it pays to do a llittle homework on color and the colors you will need in your piece. 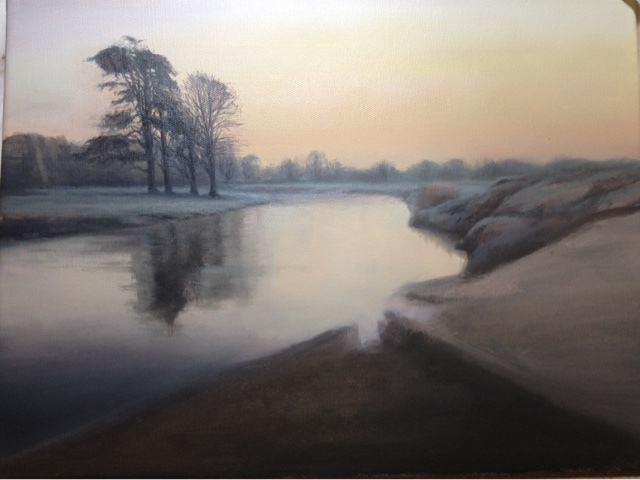 Next step- A simple approach to painting landscapes in oils. In this step I am focusing a little more on the shapes of trees in the background while also paying attention to the waterline of the river. Lights and darks are crucial at this stage and identifying where your shadows are going to fall. Once I have blocked in the trees I paint in their reflections on the water moving down the canvas. A few zig zag lines through these reflections create a sense of movement in the water. Next step: once I have the background colors more or less blocked in I can now begin to look at he foreground. The temptation is always to work on details in the foreground before its time to do so. I have learned to be disciplined and complete background details before working on foreground details. 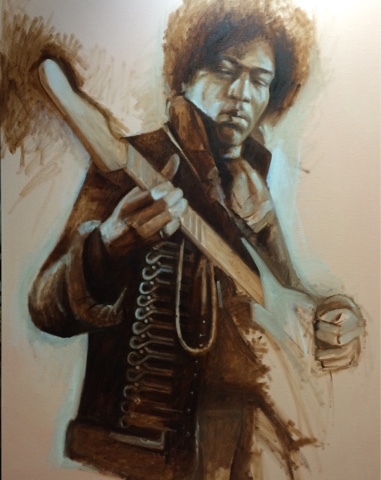 I have blocked in the darker values in the foreground and the more opaque foundation colors. 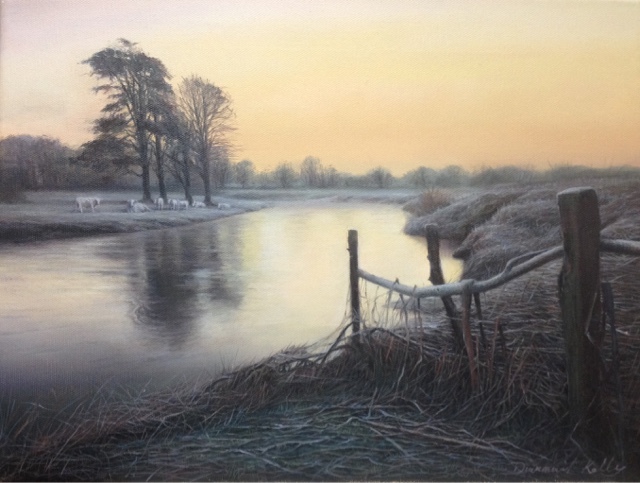 I have also blocked in the bigger shapes such as the fence posts and the spindly shapes of the dead twigs and grass hugging the fence the river bank. I have avoided using strong lighter color values in areas in the foreground with limited light. 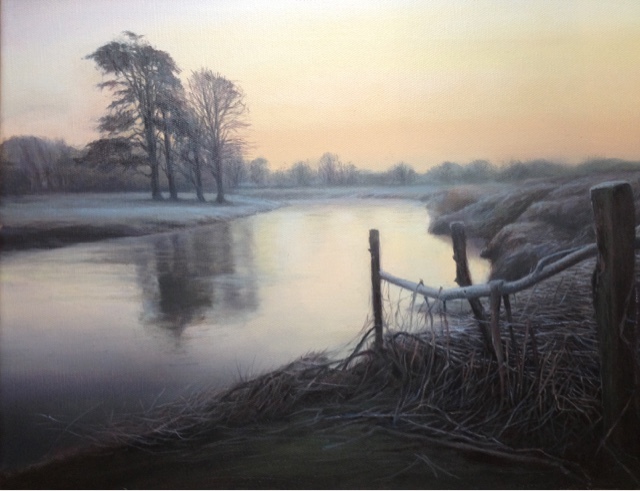 I want the viewer to be drawn into the piece and follow the flow of the river around the river bend. 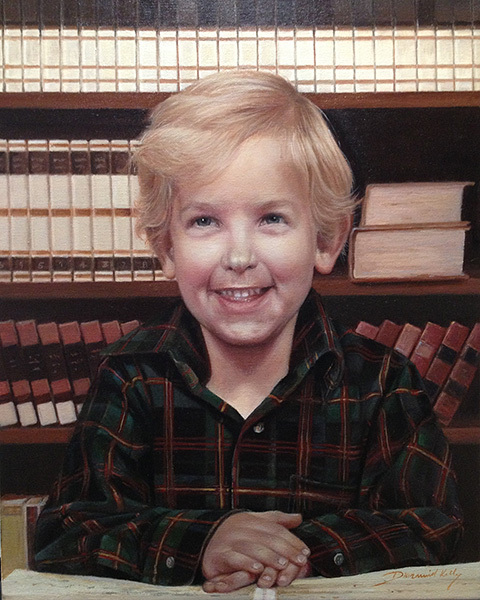 Boy in library - oil on canvas. 24"x 18"
The brief from my client was to paint a portrait capturing just the head and shoulders. kept going. My client was more than happy with the results. good business is making sure to go the extra mile"